This is the second high-profile poker player that has been the victim of a robbery at the Bellagio: Way back in 2004, shortly after his WSOP Main Event win, Greg Raymer was able to fight-off two would-be robbers as he entered his hotel room at the Bellagio. 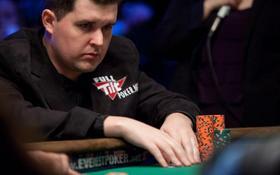 Montgomery was a member of the 2008 World Series of Poker final table, and has had a string of success in the poker world since, with over $3.6 million in career earnings and even winning his first WSOP bracelet in 2010. He is also currently dating fellow poker pro Annette Obrestad. This entry was posted on Tuesday, October 12th, 2010 at 6:22 am and is filed under Poker News. You can follow any responses to this entry through the RSS 2.0 feed. You can leave a response, or trackback from your own site.